Today Mercedes-Benz announced a line of electric cars called the Mercedes EQ. The company had intended to invest €10 billion (US$11.5 billion) on the line, but the spending has since increased, Daimler AG Chief Executive Officer Dieter Zetsche said today in Stockholm. The first of them, the Mercedes-Benz EQC 400 4matic, is an all-wheel-drive crossover SUV. It’s Mercedes’s answer to the all-electric I-Pace SUV that Jaguar just released and the electric e-Tron crossover from Audi, which will make its debut later this month in San Francisco. The EQC will also compete against BMW’s upcoming electric iX3 small SUV, Porsche’s all-electric Taycan, and Tesla’s Model X SUV. Most of them start at roughly US$70,000. The EQs, which stands for “electric intelligence,” aren’t the first pure-electric cars from the Stuttgart, Germany-based automaker. Earlier this year, Mercedes discontinued the B250e, a small electric hatchback of sorts, because of lack of sales. The company also showed its EQ Silver Arrow concept just last week in Pebble Beach, Calif. But this athletic-looking four-door crossover seems much more relevant to the ever-growing luxury electric SUV market that Tesla tapped and has everyone else playing catch-up. Even Porsche’s new Taycan, technically a sedan, is aimed at eating away at Tesla founder Elon Musk’s lead. The EQC 400 has a wide three-dimensional black-panel grille with seven different options of 21-inch bicolor wheels and torchlike daytime running headlights; the low shoulder-line has a coupelike roof and simulated air inlets in high-gloss black that run along the sides. But it may look best at night: The EQC 400 has a “Light Band” LED strip that runs across the top of the front black panel grille and connects the headlamps to the grille, plus a light band in the rear that connects the tail lamps. Inside, louvered trim runs across the dashboard and the doors. It comes standard with a three-spoke sport steering wheel and seating for five in black microfiber. Leather seats and carbon-fiber trims are available as an option. A slide-open sunroof, heated seats, and regenerative braking come standard. It’ll also have EQ-specific rose gold accents throughout the cabin, including on the air vents. The EQC 400 comes with a 80kWh battery. A dual-motor electric drivetrain drives each axle for a combined output of 402 horsepower and 564 pound-feet of immediate torque. Top speed is 112 mph, with a sprint time to 60 mph in 4.9 seconds. Both of those times are slightly slower than the I-Pace, though at 187.4 inches long, the EQC 400 is the longer of the two and likely the heavier. 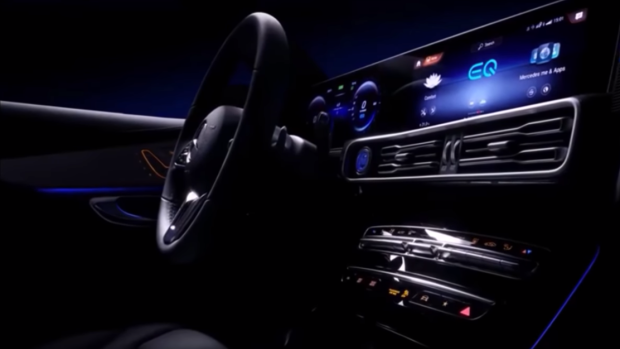 Total maximum driving range on the EQC 400 will be 200 miles, according to the 52-page press release Mercedes released for the occasion, with a charging time of 40 minutes on a 110 kWh outlet to reach 80 percent of a full charge. This seems to be the standard level now for electric luxury SUVs, on par with the Jaguar and the Tesla Model X. The time to a full charge, and the time to charge on a regular household outlet, have yet to be released. Daimler plans to offer 10 pure-electric vehicles by 2022. The Mercedes-Benz EQC 400 4Matic arrives at U.S. dealers in 2020.